Welcome to the website of the Swedish Consulate in Seattle. We have created it with the hope it will be a one stop gateway for you to get information about consular issues such as passports, visas, etc., and as a gateway to learn about Sweden and about Sweden in Seattle. Sweden is a member of the EU and as the EU integration proceeds, Sweden has adopted new rules for issuing passports, driver’s licenses as well as others. Through this site you will be able to connect with many of the official sites that will provide you with information and forms you will need. If you can’t find what you need, you are always welcome to contact the consulate directly and we will do our best to help you. As of 2008 the district of the Consulate in Seattle is the states of Washington and Oregon. “Sweden in Seattle” gives you a chance to find the Swedish organizations we have in Seattle and by clicking on the link to their own sites you can learn more about their activities and find their contact information. We have well over 150,000 “Swedes” in Seattle with Swedish roots. In addition, several thousand current Swedish citizens also live here. Many are here working for companies and institutions with close links between Sweden and Seattle. We hope this site will help you to explore and connect with the vibrant Swedish community in our area and stay updated on current and significant events. Once again you are always welcome to contact the consulate and we will do our best to assist you. 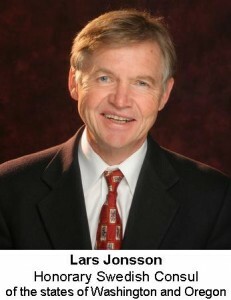 Lars Jonsson, Honorary Swedish Consul to State of Washington and Oregon.